196 pages | 7 B/W Illus. 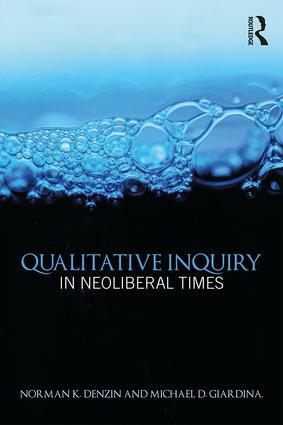 Qualitative Inquiry in Neoliberal Times is written from the perspective that the scholarly lives of academics are changing, constantly in flux, and increasingly bound to the demands of the market – a context in which the university has increasingly morphed into a business enterprise, one that treats students as consumers to be marketed to, education as something to be purchased, and research as something to be capitalized on for financial gain. The effects of this market-orientation of scholarly life, especially on those in the social sciences and humanities, are ones that demand serious examination. At the same time, qualitative inquiry itself is changing and evolving within and against the rhythms of this ‘new normal’. This volume engages with these emerging debates in qualitative research over new materialism, 'data', public policy, research ethics, public scholarship, and the corporate university in the neoliberal age. World-renowned contributors from the United States, United Kingdom, Spain, Norway, Australia, and New Zealand present a global perspective on these issues, framed within a landscape of higher education marked if not marred by efficiency metrics, accountability, external funding, and university rankings. Qualitative Inquiry in Neoliberal Times is a must-read for faculty and students alike interested in the changing dynamics of their profession, whether theoretically, methodologically, or structurally and materially. This title is sponsored by the International Association of Qualitative Inquiry, a major new international organization that sponsors an annual congress. Qualitative Inquiry in Neoliberal Times is an extremely important and necessary book in our current post-anthropocentric neoliberal condition, a circumstance in which a rhizomatic, immanent capitalism has changed everything. To quote Harry Torrance, author of chapter 5, "neo-liberalism already operates with a more sophisticated theory of change than empirical social science." The multiplicities, diversities, and unthought possibilities embedded within qualitative research serve as points from/through which this all invasive performance can hopefully be countered and challenged. Market based values permeate audit culture with its performance metrics that increasingly infiltrate higher education. This collection might help us negotiate what is already here with the threat of more to come if we recognize the stakes: the place of the university in the politics of knowledge and the forms of governmentality we will abide. We incalculable subjects have much work to do. Norman K. Denzin (PhD, University of Iowa) is Distinguished Emeritus Professor of Communications, College of Communications Scholar, and Research Professor of Communications, Sociology, and the Humanities at the University of Illinois, Urbana-Champaign. One of the world’s foremost authorities on qualitative research and cultural criticism, Denzin is the author or editor of more than 30 books, including Performance Ethnography; Interpretive Ethnography; The Qualitative Manifesto; Qualitative Inquiry Under Fire; Reading Race; The Cinematic Society; Images of Postmodern Times; and a trilogy of books on the American West. He is past editor of The Sociological Quarterly, co-editor (with Yvonna S. Lincoln) of five editions of the landmark SAGE Handbook of Qualitative Research, co-editor (with Michael D. Giardina) of thirteen volumes on qualitative research and interpretive methods, co-editor (with Lincoln) of the methods journal Qualitative Inquiry, founding editor of Cultural Studiesó Critical Methodologies and International Review of Qualitative Research, editor of three book series, and founding director of the International Congress of Qualitative Inquiry. Michael D. Giardina (PhD, University of Illinois) is an Associate Professor of Media, Politics, and Culture at Florida State University. He is the author or editor of 18 books, including Sport, Spectacle, and NASCAR Nation: Consumption and the Cultural Politics of Neoliberalism (Palgrave, 2011, with Joshua Newman), which was named to the 2012 CHOICE "Outstanding Academic Titles" list, Sporting Pedagogies: Performing Culture & Identity in the Global Arena (Peter Lang, 2005), which received the 2006 Outstanding Book Award from NASSS, and Qualitative Inquiry—Past, Present, & Future (with Norman K. Denzin; Left Coast Press, 2015). He is Editor of the Sociology of Sport Journal, Special Issues Editor of Cultural Studies, Critical Methodologies, co-editor (with Brett Smith) of the Qualitative Research in Sport & Physical Activity book series for Routledge, co-editor (with Norman Denzin) of the ICQI book series for Routledge, and Associate Director of the International Congress of Qualitative Inquiry. The International Congress of Qualitative Inquiry has been hosted each May since 2005 by the International Center for Qualitative Inquiry at the University of Illinois, Urbana-Champaign. This volume, as well as preceding volumes, are products of plenary sessions from these international congresses. All of these volumes are edited by Norman K. Denzin and Michael D. Giardina and are available from Routledge.